Over the summer I told you about a book I decided I should read. Remember, I was talking about the whole trying to eat right and exercise thing. 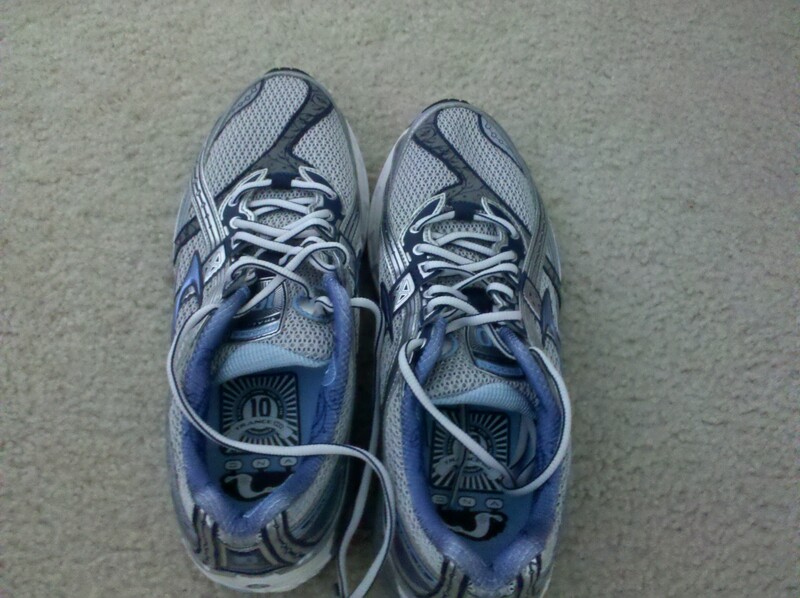 I even told you about the snazzy pair of running shoes I bought to support my healthy efforts. Last week, I read this blog post by a young lady named Sarah. In this post Sarah shares her story about how the book has really helped her to begin putting food in its rightful place in her life and set her on the road to becoming a healthier woman. It’s a great testimony! As a matter of fact it was so inspiring that I ventured out to my local Barnes and Noble (R.I.P. Borders! ), braving the lunch rush hour, to finally snag my copy of the book. I’ve been reading the book (as evidenced by the paper clip you see in the picture 🙂 ) for the past week, and I’m really enjoying it. Monday through Friday, I spend an hour each day reading a chapter then recording my responses to the Personal Reflections questions in a journal. Usually my Made to Crave time is sandwiched (no food pun intended) between my time in the gym and dinner. I never thought about it before now, but how apropos, don’t you think? I believe what’s most exciting to me about this book is that, just as I suspected, the content can easily reach far outside the box of food cravings. The truths written in this book can easily be used to teach about so many other cravings that lure us into unhealthy places and distance us from the presence of God. It’s really quite refreshing! I strongly recommend you check it out, maybe even consider it for a small group or book club discussion. I know I am. If you had to confess one craving (food or otherwise) that teases and tempts your appetite, what would it be? If you enjoyed the post you just read and you know other women who may enjoy it too, please share it with them. Click the “share” button below to send the post via email, post it on your facebook page or send it out in a tweet. A tweet would sure be sweet! Invite your girlfriends to join Full Circle Women’s Fellowship on Facebook and to subscribe to the Wisdom Virtue and Rubies (soon to be Completely You!) blog. I would love to meet them! I’m Learning What to Eat, Now What? I didn’t stop thinking about you and that post over the weekend, either. I thought about myself, as well. I’m learning a bit more about what to eat, now what? 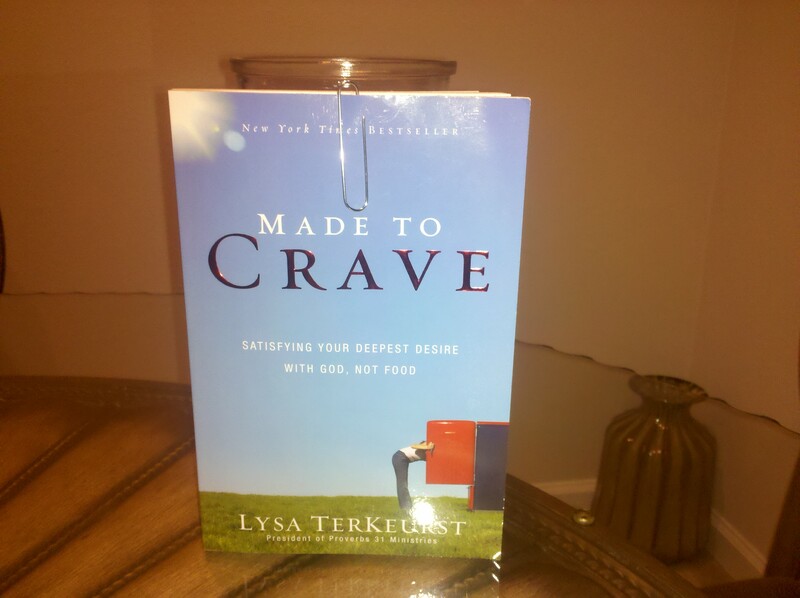 Well, Lysa Terkeurst – Author, Speaker, and President of Proverbs 31 Ministries – published a book this January entitled Made to Crave, Satisfying Your Deepest Desire With God, Not Food. You may have heard of it. I will be honest. When this book was released, I was excited for her. When she hit the New York Times Best Seller List, I was excited for her again. Yet the entire time I never thought this book/study was for me. Instead I thought things like, “I already crave God” or “I don’t crave food like the people she’s probably talking to in her book”. So, I never bothered to purchase it. My eating habits are pretty good, but there’s still evidence of a struggle. Those old habits insist on dying hard, but make no mistake, they WILL die. The only way for me to stay the course and win this battle is by renewing my mind, and Made To Crave may help me do just that. After all, taking better care of my temple is definitely “good and acceptable and perfect” (by the power of the Holy Spirit), don’t you agree? At the end of the day, where there is a renewed mind, there’s staying power. Summer’s officially here, and we girls are always trying to get in shape for the summer. Maybe it’s time for us to try to get in shape for all seasons, for the rest of our lives, and for the generations coming behind us. Promise me you’ll at least consider it. I would certainly love to have you. I’ll give you some time to read the intro, and I’ll check back with you in a few days. Is that fair? Well, I sure hope so. Ladies, is anyone out there struggling with food, weight, or weight related health issues? UGH…. I tell you, I have never been a lover of food. I mean, I enjoy food, but I mostly eat because it’s necessary. The foods I enjoy most are, of course, the ones that are clearly the worst for me. Isn’t that usually the case? Lately, it seems I’ve been hyper sensitive to things like the food I eat and how much I weigh. I don’t know why. Maybe it’s a side effect or prelude to turning the big 4-0 next year. Truth be told, my eating habits are a FAR cry from the mess they used to be, and I’m thankful for that. For a person who is really a pretty nice size and who doesn’t even own a scale, I obsess over my weight and swear I can tell when I’ve gained even a fraction of a pound. Yesterday, I sent a frantic email to a nutritionist on a wellness website offered through my employer (what a WONDERFUL benefit). It felt good to tell someone of my struggle and begin getting some simple tips I can incorporate to complement the changes I’ve already made in my life to live better and feel better. Looking better isn’t a bad deal, either, right ladies?! Good morning. Earlier this year I was told by my PCP [primary care physician] that I am “Pre-Pre-Diabetic”, whatever that means. It had something to do with a range of numbers and where I fell in that range, according to lab work done for my annual physical. Diabetes TERRIFIES me. I’ve watched 2 grandparents succumb to the disease, and I am watching my father’s body slowly break down because of it. For as long as I can remember I’ve been afraid “I’d be next”! I have intense carb craving sometimes; other times I have the self-control to “just say no”. I’ve cut out most refined sugars. My doctor advised me to follow a low-carb/low-sugar diet, but I have no idea what the measurement for “low” is. I eat lots of fruit, but I’m concerned that it may contribute negatively to the sugar and carb end of the spectrum. Subsequently, I’m near tears most days, worried about what I should eat and feeling like I will never enjoy eating again. I have started working out regularly, and for the most part I eat well. I probably don’t eat ENOUGH food. I’m not a big meat-eater, although I do enjoy meat. I’m struggling to find protein alternatives and figure out how to get more protein in my diet. I’ve started shopping at grocery stores that carry more organic and whole foods, but of course, this is quite expensive. I used to be a HORRIBLE candy eater. These days, my vices are french fries and frozen yogurt with plain M&M’s or dark chocolate chips (been that way since I was a kid). I would like to lose a few more pounds, but beyond weight, I just want to eat well. I am 39 years old, unmarried with no children yet, so I want to form better habits to pass along when the time comes and stop the spread of this crazy disease throughout my family. Hypertension, heart disease and diabetes all run in my family. I will be honest. I am afraid, and I just need to have a place to start with my eating. Any tips you can offer are greatly appreciated. Making lifestyle changes now can certainly help you to avoid diabetes. However, it can certainly be daunting when you don’t know where to start. What raises your blood sugar (and leads to diabetes) is intake of simple carbohydrates. These include sugar and refined grains (white flour, white rice, etc.). Here are some good places to start. 1. Make sure that all your grains are whole grain. You don’t need to buy expensive organic foods, whole grains can be found at any grocery store. Look for “100% whole grain” on the label when buying bread. Avoid things like processed, boxed foods (macaroni and cheese, rice mixes, etc). 2. Incorporate more veggies. Your veggies can be fresh or frozen, just make sure that you don’t weigh them down with heavy sauces. These will help to fill out your meals and help you to feel more full without adding carbohydrates. 3. Make sure you are eating regularly throughout the day. When you skip meals or go for too long without eating, you get peaks and valleys in your blood sugar which is not good. Also, when we go for too long without eating we tend to make choices that are not as good. 4. Make sure that every meal and snack includes some protein. This can be in the form of dairy, meat, eggs, soy or nuts. Adding protein to every meal and snack helps regulate blood sugar and also keeps you feeling fuller between meals. Try our diabetic meal plan on this site for some good ideas of foods to eat at meals and snacks. Diabetes is scary, but you are doing the right thing by taking steps now to avoid this.